The Keystone Service is a quiet giant. A simple, more-or-less hourly regional train, it only takes an hour to get from Philadelphia to Lancaster and a bit more to Harrisburg. It also adds extra hourly trains on the most-heavily-traveled intercity railroad in North America: the Northeast Corridor between Philadelphia and New York. It does all of this through simple, done-under-the-radar improvement of the old Pennsylvania Railroad mainline between Philadelphia and Harrisburg to 110 mph running. Right now, Harrisburg is where improvements end, though. This is not an accident. While Norfolk Southern bypasses the former PRR mainline east of the Susquehanna, it uses it -- intensively -- to Pittsburgh. Electrification, and therefore the territory Keystone Service push-pulls can cover, also ends at Harrisburg. And finally, the terrain becomes significantly more mountainous, and the railroad more curvy, as it follows the Juniata River valley deep into core Appalachia's corduroy, up and across the Alleghenies, and back down the Conemaugh River valley. As it stands, with more operating funds (i.e. enough to purchase a couple of trainsets, engineers, conductors, and slots) integrating a few more daily trains between Harrisburg and Pittsburgh appears perfectly viable. A push-pull setup with an electric at one end and a diesel at the other would also allow these runs to be integrated into the Keystone's existing schedule. And there is the tantalizing possibility of night trains, which Sic Transit Philadelphia discussed a couple of years ago. And, with relatively simple improvements (bringing back the fourth track, increasing superelevation on the passenger tracks) speed can be brought up for passenger runs, making them more competitive than the Daily Pennsylvanian's current 45 mph average speed. But that's all for regional trains using the classic track to access the hill towns, towns which have relatively high ridership due to (a) the trains arriving in the afternoon and (b) a general lack of Interstate/freeway competition in the area. * Good regional service is important, but Pittsburgh is a large city and therefore a large travel market; it sits at the crossroads of the Northeast and Midwest; if Pennsylvania wants to compete with New York's Water Level Route and get a slice of that pie for themselves, it's going to need a new passenger route built to significantly more modern standards than the old PRR line. If Keystone East is an experiment, it's one of the most successful in all of American passenger railroading. It established not only the existence of a rail travel market from a larger city to smaller ones out in its hinterland, it also established that high ridership is a function both of frequent service and a reasonable fare. But it is also an experiment abetted by advantageous geography and the civil engineering prowess of the Pennsylvania Railroad, and when the PRR electrified their Northeast Corridor in the 1930s, the Main Line section only went to Harrisburg and Enola. Plans to electrify the Middle Division, the section through the mountains to Pittsburgh, were discussed, but came to naught with postwar dieselization. It's also arguable Harrisburg and Lancaster play outsize cultural roles in the state. Lancaster is, after all, its eponymous county's seat and the heart and cultural center of Pennsylvania Dutch Country (there's a reason Turkey Hill's motto is "Imported from Lancaster County"!) Harrisburg is the state capital ... not much more needs to be said. Head east down the PRR mainline from Pittsburgh and the same opportunities don't present themselves. Johnstown and Altoona are fair-sized burghs,* yes, but one data-lite argument that can be made is that the relatively greater importance of Keystone East would naturally drive a higher ridership than a similar service profile on Keystone West. I don't buy this argument. Not because I think population doesn't matter -- it obviously does; more people means more potential riders -- but rather because it attempts to explain a particular result a particular political class doesn't like by avoiding having to deal with, you know, actual data and competent modeling. Data-lite arguments often tend to carry exceptionalist undertones, too, seeking ways any result can be construed as a "special case" instead of looking for commonalities to build generalizations. Alan Garfinkel had a thing or two to say about that kind of reasoning. All that said, however, it is clearly not easy to get from Harrisburg west. But it may be easier than often given credit for. The cost of building a new line, as J. Edgar Thomson appreciated when he engineered the PRR's mainline, is a function both of its length and the relative difficulty of its construction. Length scales linearly, difficulty exponentially. This is why he decided to concentrate nearly all of the mainline's most challenging features in one spot: between Altoona and the Conemaugh River's water gaps through Laurel and Chestnut ridges to the west of Johnstown. East of Altoona, the line follows the water level route of the Juniata River; west of Chestnut Ridge, the mainline crosses the Allegheny Plateau while a low-grade freight line follows the Conemaugh down to the Kiskimentas and eventually Allegheny rivers. 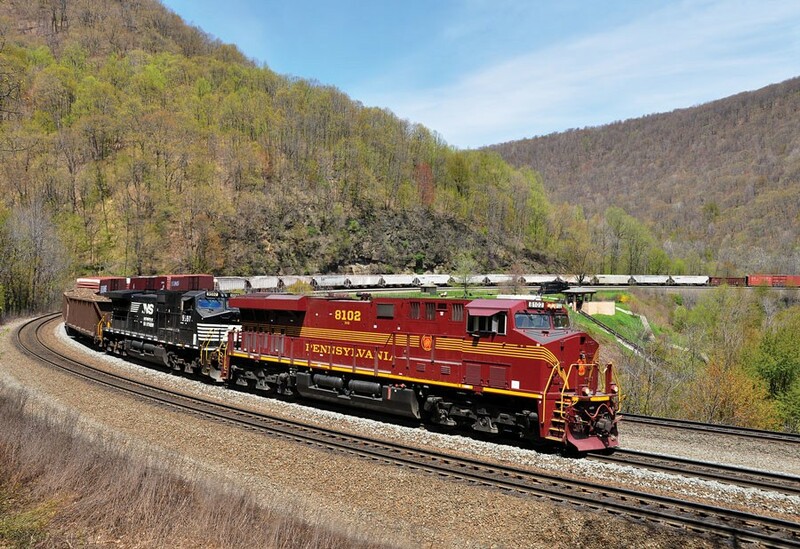 Norfolk Southern currently runs heavy eastbound (uphill) trains up the Conemaugh Line and lighter eastbound and all westbound traffic along the mainline. The lines rejoin by Heinz Stadium in Pittsburgh and pretty much anything that isn't a unit train's going to originate or terminate in Conway Yard a few miles down the Ohio. This is a traffic pattern of convenience, though: were there heavier passenger service in the Pittsburgh area, the Conemaugh Line would be able (by double-tracking it again and upgrading the signaling) to bypass most of it. What I'm getting at here is that, from Pittsburgh all the way to Conpit Jct., where the mainline and Conemaugh Line meet, it's perfectly possible to convert the mainline to a passenger line. Which is useful, seeing how it's a natural commuter and regional rail route. It also offers a useful terminus for a fast passenger route through the mountains at Latrobe, a burgh sitting snugly at the foot of Chestnut Ridge, and where the line curves from following the ridgeline and instead heads directly west. Like Keystone East, this "Keystone West" uses the PRR's civil engineering prowess to its advantage, upgrading an existing line to high-speed standard. It also offers an easy commuter rail corridor extending from Pittsburgh either to Greensburg, Latrobe, or Johnstown, along with improved regional services along the classic corridor. This latter is necessary because a high-speed bypass through Appalachia's Ridge and Valley province must be just that -- a bypass. Like all trellis river systems, the Juniata curves too sharply as it crosses from water gap to water gap to be useful for faster travel. Instead, the Keystone Corridor's new middle division must punch through the mountains on an extremely low-curvature corridor. * The Pennsylvania Turnpike (I-76) runs well south, along the former South Penn RR right-of-way; I-80 runs well north, and if it could avoid trees along with everything else in these parts, it probably would, too. ** The combined population of Harrisburg (49,673) and Lancaster (59,322) is 108,995; their MSA's, better for intercity planning, are 509,074 and 507,766 for 1,016,840. For Johnstown (20,978, 140,499) and Altoona (46,320, 127,089), that's 67,298 and 267,588. 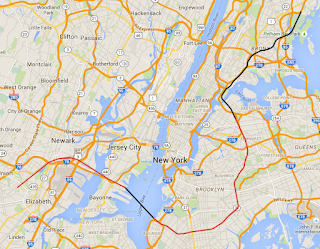 Cross Harbor Rail Tunnel: Changing the Traffic Patterns in New York? 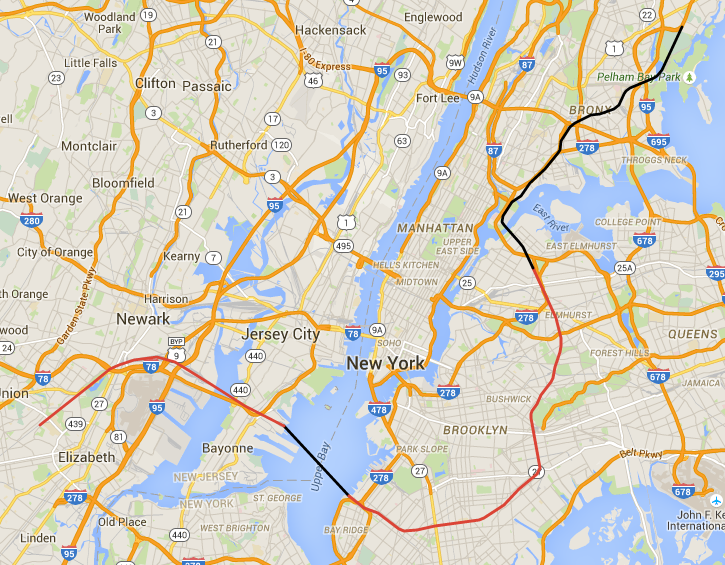 The Cross Harbor Rail Tunnel (or Cross Harbor Freight Tunnel), black under the Upper Bay, would link Norfolk Southern's line to New York (red, Newark) with the Bay Ridge Branch (red, Brooklyn), which would then continue to the Providence & Worcester connection across the Hell Gate Bridge (black, Bronx). Such a connection would change freight traffic patterns not just in the New York area, but throughout southern New England. The Cross-Harbor Freight Tunnel is a slowly advancing project that proposes to link Norfolk Southern's (NS) Greenville Yard (part of the Oak Island yard complex) with the Long Island Railroad's Bay Ridge branch. Estimated at $7 to $10 billion, such a project is not cheap, but it is definitely moving along, having recently completed a DEIS. The basic plan is to either provide a tunnel or a (much cheaper, order of magnitude less capacity) carfloat operation to a new terminal facility "in Queens" -- the idea being, that this new rail route would help link together New York City's piecemeal freight network. As it stands, most mainline freight in the New York area either originates or terminates in New Jersey -- mainly in Newark. This is an artifact of the way American railroads were created and maintained: at one point, half a dozen railroads came up to the Hudson River's west shore, while half that lay on the east shore. Carfloats linked the two together. One still survives. At one time, a long-distance bypass of the city used a bridge at Poughkeepsie -- this is no longer in service -- requiring any train originating or departing New York City to clear what is known as the "Selkirk Hurdle," heading north to the first active rail crossing of the Hudson just south of Albany. (Making things worse is that the Hurdle is run by NS' competitor, CSX.) Unsurprisingly, this means that the vast majority of freight traffic either in the city, or transshipping it, goes by road: even with jams, crossing the George Washington or Tappan Zee is, by an order of magnitude, shorter. So the idea is that a new freight terminal on the New York side of the Hudson from points west will help alleviate trucking congestion on the road Hudson crossings -- especially for trucks headed to Newark's vast land- and seaports. Carfloating, even significantly more intensive carfloating, would not be enough; a fixed link is what's needed. This ... isn't really enough of a justification to drive an $11 billion investment. But something else is. To understand what is, though, first we must look at NS' and CSX's current Northeastern mainlines and traffic patterns. 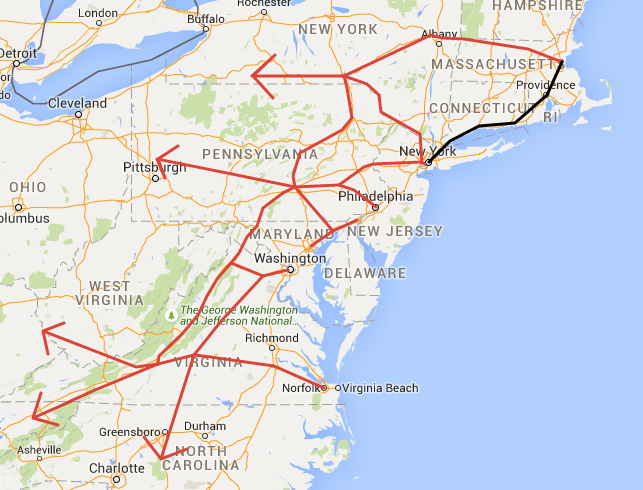 Norfolk Southern's northeastern mainlines. Note relative circuitousness. 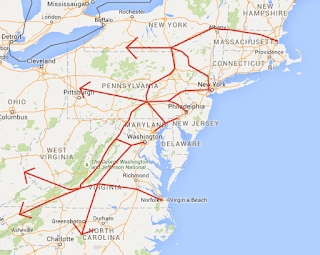 Conrail, the phoenix of the old Northeastern rail net, had a network that linked together all the Northeastern cities. When NS and CSX split it down the middle in 1999, each side took the parts of Conrail's network that extended their own operations. 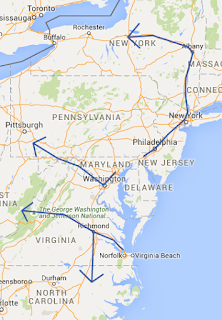 CSX already had a mainline from DC and points south and west into Newark. 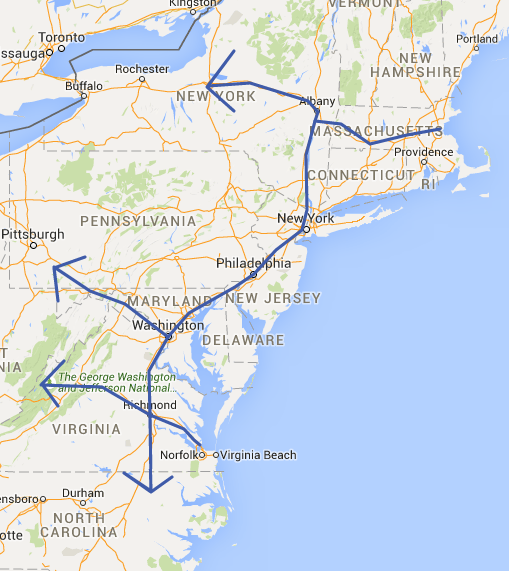 This route runs through the hearts of the Northeastern cities -- DC, Baltimore, Philadelphia -- and connects to mainlines to the west and south. Augmenting this, CSX took control of the West Shore Line, Selkirk Yard, and the old Boston & Albany, as well as a new western mainline, the so-called "Water Level Route" from New York to Buffalo. NS, meanwhile, had no real access to the Northeastern markets (other than DC) prior to 1999. So what it acquired out of Conrail was the lower Northeastern network it had kludged together to replace its predecessor's mainline -- the one Amtrak now runs Acelas on. Calling it a "mainline" would be rather unkind, though -- it would be far more accurate to say that it was a series of terminal branches that radiated from Conrail's "Broad Way" mainline from points west to Harrisburg, PA. That is, what the NS got was, was this mainline and its terminal yard (Enola) as well as the branches to Newark, Philadelphia, Baltimore, and Wilmington. It connected this with its own railhead at Hagerstown, MD, and would later assemble a route into Boston via Scranton, Binghamton, and Albany. 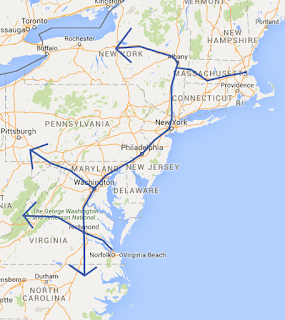 CSX got the more direct route and NS the more circuitous one. But the CSX line suffers one key competitive disadvantage: because of no fewer than three tunnels under city streets, CSX cannot, in fact, run Plate K-clearance (double-stacks, auto racks) trains north-south. One of these, in Philadelphia, conveniently came with a bypass in the Conrail purchase; another, in DC, is being rebuilt to expand capacity. The third, in Baltimore, continues to split CSX's mainline in two. It can't, in fact, run a double-stack train from New York to Newport News, VA, without an enormous detour through Ohio! Meanwhile, the NS mainline avoids the most-heavily-populated areas, for the most part. That means that NS trains you see in the cities either just departed from their terminals or are about to arrive at them. And, other than the circuitous Harrisburg-Boston alignment, its terminal branches from Harrisburg are reasonably direct. This brings up what does justify dropping $11 billion on the Cross Harbor Freight Tunnel: New traffic patterns. 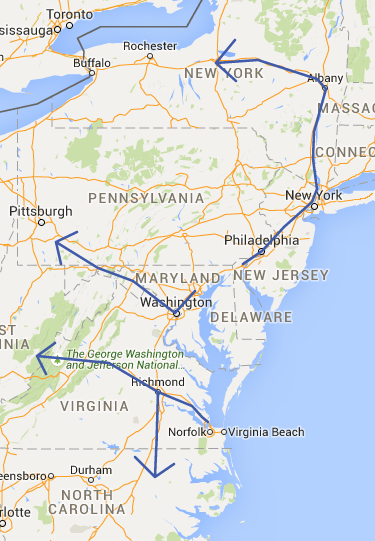 Specifically, one involving a direct route from Harrisburg to Boston via New York City. How, exactly, does the NS get to Boston? NS developed its Boston gateway -- the "Patriot Corridor" -- not on its own tracks but rather via what are known as trackage rights, which are (quelle surprise) the right for one company to run its train on another's railroad tracks. In this case, the trackage rights extended across two other railroads: the Canadian Pacific-owned Delaware & Hudson (D&H) from Sunbury, PA to the Albany area, and the Pan Am -- once an airline that went bankrupt whose branding got bought by a railroad -- from there on to Boston. Later, NS would buy the D&H portion outright as its owners culled what was, for them, non-core trackage. There are several major problems with this alignment. First, it's really circuitous. And second, it's a mountain road: it follows the Susquehanna River all the way to Binghamton, NY, and from there runs along the back of the Catskills into the Mohawk Valley. And once there, getting into New England requires crossing another mountain range! Freight operators prefer low-grade routes, and the NS' is anything but. From the NS' perspective, a more direct, low-grade water level alignment would be preferable. A candidate railroad does exist -- the Providence and Worcester (P&W) -- but the problem is, it lacks a direct connection with the NS. And this is where getting onto Long Island comes in handy: the P&W runs over the Hell Gate Bridge, terminating at Fresh Ponds in Queens. Make that connection and you've just landed yourself a brand-new freight alignment, one that also hits all the smaller ports on the way. Transshipment at the docks: now that will actually start to cut down on truck congestion, as well as provide a revenue source for the railroads. Win-win-win, and we're looking at something now that might actually be worth $11 billion. Ah, but there is one more thing about the New York market that makes life complicated. It's the nation's largest and busiest passenger market, and while the NS doesn't really have to worry about it so much due to a convenient quirk of Victorian-era line placement, the P&W doesn't really have a choice. It isn't just the Hell Gate Bridge: the P&W's mainline and the Northeast Corridor are one and the same. What that means is that -- while you get a straight, flat, fast route -- you also get one with limited freight slots and whose clearance is determined by overhead wire. And, just to make things all that much more annoying, the part with the greatest passenger-traffic density, New York to New Haven, has very limited, if any, bypass options. So, while the NS gets a nice shiny new tunnel and a new partner railroad, it also gets its partner railroad's baggage -- 10 tpd's worth of slots instead of 20 or so, and serious clearance restrictions to boot. While double-stacks can be hauled under wire for short segments -- the Norfolk Southern does under SEPTA wire in Norristown, and CSX probably does (also under SEPTA wire) out around the Oxford Valley from time to time -- freight haulers generally prefer not to. * And this route has an unavoidable stretch of haulage under wire all the way into Connecticut, even if your New England intermodal terminal is Worcester. What this means for NS is that they will have two partner railroads into New England, but both present inferior routes relative to the CSX's (a natural extension of the Water Level Route, albeit one requiring a stretch of mountain railroading). Despite the Cross Harbor Rail Tunnel's design allowing double-deck transit, the run-through unit trains an NS-P&W partnership would entail would have to be somewhat ... squatter. What does this mean for passenger rail? The effect for Amtrak, MNRR, and LIRR operations would be minimal. It's very likely NS-P&W trains would only be given night slots, due to the daytime congestion of the New Haven line. But the biggest effect would be on Triborough RX. The Triborough RX proposal [i]as it stands[/i] requires half the Hell Gate's track capacity, and more importantly, the ramp connecting the bridge approach with the Bay Ridge branch. While Triborough RX can be built at the edge of the Bay Ridge branch right-of-way, either as the Sea Beach Line is, the Canarsie Line (and also able to tie into both), it's very likely the freight requirements would conspire to eliminate the trackage available for Triborough RX. Remember, even though the freight connection can operate with a single track, the subway will need at least two, which means there is an unresolvable conflict of interest on the Long Island approach, where only two tracks are available. If we agree the main purpose of Triborough RX is linking Brooklyn, Queens, and the Bronx together, then that erases the line's main advantage, at least in its current form; Triborough RX would need an entirely new connection over or under the East River to remain viable. Finally, a freight connection directly linking the Norfolk Southern's Oak Island Yard with a P&W connection at Hell Gate would solve one major New York transportation problem -- it would finally surmount the Selkirk Hurdle -- but at the same time, it would bring into focus the next logical issue: inadequate infrastructure to support operations between New York and New Haven. While several analyses of needed investments to improve that section have been done, a Cross Harbor Rail Tunnel would throw a new need into the mix: a freight route, preferably one that accommodates double-stacks. (The two potential solutions are to either widen the existing railroad or build a new alignment alongside I-95.) And that, in turn, would drive need for more slots across the East River -- a condition that would turn Hell Gate into a chokepoint. The long-term effect of the Cross Harbor Rail Tunnel, therefore, would be the establishment of eight tracks of throughput demand across the East River at Hell Gate -- and while long distance, HSR, regional, and commuter trains can all be blended onto the same infrastructure, NS and P&W requiring 25 or 30 slots (instead of 10) per day may not be able to. And Triborough RX, requiring separated infrastructure, definitely can't. * That said, there has long been the claim (which I haven't been able to substantiate) that double-deck intermodal trains run under wire in China. It's a tired old truism today that the United States is better at freight rail, while Europe is better at passenger rail. Yet this was not always historically so. Until WWII, European and American companies were equally good at both types of services, and in the first postwar generation both saw equally precipitous declines in freight transport, as highways and truck transport took over less-than-carload and time-sensitive shipments. By the mid-1970s, railroads on both side of the Atlantic were functionally bankrupt vis-a-vis freight; the catastrophic meltdowns of the Penn Central and Milwaukee Road were merely the most visible effect of a way of doing business that had ceased to be solvent. In Europe, nationalization of the rail networks, and the national carriers' passenger focus, helped hide this. European freight services were often loss-leaders, competing head-to-head against trucking. Meanwhile, in the United States, a move was made to transport bulk goods, and transport them effectively. The advent of containerization allowed general freight to be shipped cross-country as bulk loads, originating in Los Angeles and terminating in New York. Coal unit trains, trundling between mine and power plant, often never need classification. Nationalization of passenger service, relaxation of shipping-rate regulations, and consolidation in the railroad sector -- a process that had begun during the Long Depression, but stalled in the cabal era before it began again apace postwar -- all had a hand to play in this process, and today the United States is often cited as the most efficient freight railroad network in the world, its companies posting record profits. Contrast this with Europe. The development of high-speed rail has opened more space on the classic lines, but often freight operators -- usually the national rail companies' red-headed step-children -- have failed to take advantage of the improvements. Part of this is, of course, historical. Sealanes have historically controlled Europe's bulk-shipment sector, and until the end of the Cold War, most of the overland bulk routes would have run through Warsaw Pact territory. But the Cold War is twenty years over, and most of the countries along the best bulk routes have been integrated into the European Union, with accession work being done for the remainder (most importantly here: Serbia). Actually, the biggest structural problem Europe now has is the legacy of rail nationalization. Picture, for a moment, if you will, an alternate United States where every individual state nationalized its internal railroad network. Today, a container bound from Los Angeles to New York requires all of one interchange*, but over its journey it'll cross through eleven states**. If all of those states had their own rail networks, this same shipment would have had to interchange no fewer than ten times, and most likely have to be reclassified multiple times, despite intermodal trains' crack nature. That is the structural problem, the reason why European freight rail is less efficient and less profitable than American freight rail. Only in a small handful of corridors where reclassification needs are limited (if not outright nonexistent) -- say Calais-Marseille, entirely in SNCF territory, or Rotterdam-Genoa via the Gotthard Pass or Hamburg-Trieste via the Brenner Pass (three countries each) -- can bulk freight begin to become possible. And while each of these routes offers a significant advantage to running around the Bay of Biscay and through the Strait of Gibraltar -- Trieste most of all, as ships would also have to head around the boot of Italy and up the Adriatic Sea -- greater advantages accrue the further east you go, as the maritime detours become longer. Rotterdam-Istanbul, as an intermodal-freight mainline, makes all kinds of sense. The overland route is around 2.5 times shorter than the maritime one***, most of the mainline (by and large, the old Orient Express route -- yes, that Orient Express) lies in EU member states' territories, and Istanbul's historic and modern role as global entrepot makes it an obvious terminal for Suezmax container ships from China -- a much shorter journey than going all the way around Africa! -- as well as the principal port-of-call for Turkish manufacturing. Rotterdam is, obviously, Western Europe's Port of New York. But the problem is that -- to get from Istanbul to Rotterdam -- you have to go through Turkey, Bulgaria, Serbia, Hungary, Austria, Germany, and the Netherlands -- seven countries in all! All of which have their own national rail networks! And so even a crack express intermodal is stalled by interchange after interchange after interchange before it gets where it needs to go. The enormous efficiencies of Europe's mainline rail network -- large-scale mainline electrification, for example -- are completely gobbled up and wasted despite rail's natural geographical advantage. There are a few ways to solve this problem. One possible solution would be a return to the common-carrier model, where a given railroad is expected to offer equal passenger and freight service. For example, Britain's London Northeastern Railway (LNER) made most of its money -- about two-thirds of it -- shipping coal. In a common-carrier scenario, railroads would privatize, and then begin the consolidation process into common-carrier systems. The problem with this is, of course, that the common-carrier model failed. The developed world's highly unbalanced railroad networks, favoring freight in North America and passenger in Europe, are an artifact of this failure, one which occurred because common-carrier railroads, in practice, used profits from freight operations to cross-subsidize passenger operations, a practice which remained effective only as long as railroads held a monopoly on overland travel. The other possible solution, which began to be experimented with in British Rail's privatization, is the open-access model. Unlike under the common-carrier model, in which a railroad is responsible for both the infrastructure and services offered on that infrastructure, in an open-access model, one entity is responsible for the infrastructure -- the train tracks, bridges, tunnels, cuts and embankments, electrification, signalling, dispatch, etc. -- and it sells slots, or time windows for operations, to various service providers (what are, in the UK, called "train operating companies" or TOCs). In a way, the open-access model functions not unlike a toll road: you pay to access and use the infrastructure provider's network. When tracks are owned, and services provided, by the same entity, the pressure to skimp on maintenance is moderated by a need to avoid accidents and deliver to the customer exactly what one said one would -- because, if you don't, you lose your customers and hence your revenue. Nevertheless, American mainline railroad maintenance (never mind branch lines!) is inferior -- by an order of magnitude -- to its European counterparts, lagging behind not just in obvious things like electrification but less obvious things like signalling. American trains are exceptionally heavy, and seem to have spent the past thirty years adding more and more weight in an effort to increase long-haul tractive power at speed at the cost of acceleration: trains so heavy rail spreading is a surprisingly common occurrence, as are the derailments it causes. The British experience shows that the actual provision of rail infrastructure most certainly is in the public interest -- not just because rail disasters tend to be low-frequency high-impact events, but also because the frequency of rail accidents (and hence disasters) is, for obvious reasons, negatively correlated to increased infrastructure spending. In fact, I'd go as far as to say that the organization or agency charged with delivering rail infrastructure must be nonprofit but also must be removed from the public sector enough to not be interrupted by meddling politicians looking for pork for their constituents over that of the state's needs (in this, Network Rail's increasingly cozy relationship with its "public" side is worrisome). Clearly, no matter how you structure it, you have to decrease the count of infrastructure providers as much as possible. Thirty different providers in Europe is just as bad as fifty different ones in the United States would be. If every state in the Northeast provided its own rail infrastructure, every single Acela run would have to involve the successful cascade of nine service slots (DC, Maryland, Delaware, Pennsylvania, New Jersey, New York, Rhode Island, and Massachusetts). The same would hold true for an express freight route. Indeed, the unwieldy nature of such a construction was recognized so early that the Pennsylvanian, Delawarean, and Marylander companies allied with each other to construct a Philadelphia-Baltimore railroad had already merged together by 1840. For the sake of all users, it turns out that, when providing moderate- to long-distance freight and passenger rail^^, political borders are sort of a mirage. Far more effective, for our intermodal railroader, would be a infrastructure provider that sells a single slot all the way from Istanbul to Rotterdam (or from LA to New York, for that matter). But at the same time, that is far less effective for passenger services, which, it seems, generally need a relatively compact infrastructure operator responsive to their needs. And suddenly we run into a strange optimization quandry. Infrastructure providers at the state level^^^ are generally better for passenger rail, save in places like the Northeast where the conurbation has gobbled a bunch of states up, while those at the level of large regions favor freight rail. It is telling there are only seven Class I railroads in the US: two serving the West, two the East, two Canada (both with significant US holdings), and ... the Kansas City Southern. Contrast this to the height of the common-carrier era, when there were around a hundred distinct Class I railroads*^. Even today, providing rail infrastructure at the regional, rather than the state level, makes more sense; the Class I's were all large regional carriers, serving multiple distinct regions: the Northeast and Midwest, for example, or California and the Far West. But if you broke the United States' rail infrastructure up into its natural provision regions -- the Northeast, Midwest, South, Greater Texas, Interior West, California, and the Cascades -- you suddenly have the problem of an increased interchange count and hence an increased fragility w/r/t slot timing for transcontinental bulk shipments. This is less of a problem in Europe, where regional providers would remove some of the interchanges and hence headache, especially in the Balkans. No matter how you slice it, though, it is clear the open-access model has both advantages and disadvantages. Already, DB Schenker has acquired half of Western Europe's freight providers, locking down all the ones east of the French border between the North and Adriatic seas. The stirrings of transcontinental-scale freight rail are beginning again in the EU, just as surely as the stirrings for better passenger rail are beginning again in the United States. The only real questions are: Who will own and maintain the physical infrastructure? And will their control over it be a help or hindrance? * It is fair to point out that early intermodal services from the Port of San Francisco to New York via the Alphabet Route would have required up to six interchanges (e.g. WP-D&RGW-CBQ-NKP-WM-RDG-CNJ), but the vast majority of transcontinental American shipments have never required more than one interchange (usually in Chicago) ... except to/from San Francisco, which until very recently would have required two interchanges west of the Mississippi. ** Say, via the BNSF to NS: California - Arizona - New Mexico - Colorado/Oklahoma (forget which, it's in the damn corner) - Kansas - Missouri - Illinois - Indiana - Ohio - Pennsylvania - New Jersey. *** And, for those of you who want to point out you can run a barge up the Rhine and down the Danube instead, bulk rail tends to compete toe-to-toe with river shipments. If that weren't the case, the Illinois Central Gulf, whose mainline duplicates the Mississippi, wouldn't have been so profitable the Canadian National bought it! Incidentally, the land route between Los Angeles and New York is only about twice as long as the sea route via the Panama Canal. ^ A less conscientious observer might point out that an awful lot of this sounds a lot like fraud. ^^ And rail service of any sort, really. ^^^ I've been using the term "state" with the tacit understanding that, for the purposes of this discussion, an EU member "state" is only moderately more sovereign than a US "state". Or, not to put too fine a point on it, at the transcontinental level, for infrastructural purposes, EU member states and US states are more alike than they are not. *^ That said, many of the Class I's of the era wouldn't count today. None of the New England railroads then would have had the inflation-adjusted income figures (just as they don't today), for example; trying to figure out which 1950s Class I railroads would still count as such in 2010 would be a tedious and largely pointless process. But, no matter how many would get kicked down to Class II status, it is clear that there were an order of magnitude more then than there are today. Protected bike lanes are a long time coming in Philadelphia. Five years ago, we were among the country's leaders in bike infrastructure -- back when buffered bike lanes were the big new thing -- but while other cities, such as New York, D.C., and Chicago, rolled out ever-more-extensive bike infrastructure, we ... regressed. Pointless "super-sharrows", an infrastructural solution now a decade out of date, were installed instead on Samson Street. Even so, a cadre of geeks have been beating the drum to improve the buffered bike lanes we already have and install new protected cycle lanes. And it looks like we have some headway: Ryan Avenue linking Mayfair to the Boulevard in the Northeast is due to receive the city's first protected bike lane, and the Bike Coalition's now beating a drum for the installation of one on Chestnut Street in West Philly -- which yours truly first conceived of some three years ago now, back when the buffered bike lane on Walnut was installed. This, as Tom Beck reports for Citified. Part of the issue is spatial. Philadelphia's major core streets just don't have a lot of space, and in fact a lot of our bike-friendliness is because of that. It's not particularly suicidal to ride down, say, 6th Street in South Philly, where you have to be a douchy driver indeed to exceed bike speed. (Though we do have more than our fair share of douchy drivers.) It's much more difficult to ride along wider, overstriped streets with more traffic lanes than they really need. Sometimes, as is the case with 22nd Street in Fairmount, the extra space exists without the taking of a traffic lane -- but the political will does not. And Center City's principal buffered lanes, the ones put in before Ariel Ben-Amos moved over to the Water Department, all involved the taking of a parking lane to be put in, in the first place. That said, there are definitely avenues in the city fit for protected bike lanes. Lots of them. In general, if there's a flush median a.k.a. a center turning lane a.k.a. a suicide lane, there's space for bike lanes on either side. And if both bike lanes and a center turning lane exist, there's space to make them protected. Here are more than a few examples. * And, though the old core might be largely bereft of places to put protected bike lanes, as you head out into the Northeast, there is plenty of underutilized space on streets such as Frankford, Castor, or Tyson avenues, space currently given over to passing lanes that makes crossing streets harder than it need be. It might be all politics in the end, though. Bike commuting is concentrated around Center City, and most of the Bike Coalition's protected cycle tracks abet that. Despite the prevalence of striped lanes in the Northeast, it's still perceived as a place where one drives. And our 2.4% commute mode share is, in absolute terms ... not a lot. It'll take a commute mode share closer to 20% before bike commuting is thought of as something other than a "hipster thing" short of massive Millennial political coalition-building. * The one caveat we must observe is that major mass transit infrastructure, such as a busway or light rail line, has a natural priority over bike infrastructure. Indeed, this is the main difficulty with installing bike infrastructure on Girard Avenue. This is also what makes Erie the most difficult of the Bike Coalition's recommendations: the 56 uses the old trolley median (closed to traffic) as an impromptu busway. And, seeing as the route is one of the city's busiest, improving mass transit capacity along Erie takes precedence over improving bike infrastructure. The Market-Frankford Line has a capacity issue. It's crowded during rush hour. And its crowding isn't just in Center City, it's end-to-end. Many people use the el to connect to the NHSL, 101 and 102 trolleys, and buses points west at 69th St., and buses points northeast at Frankford and Arrot terminals transportation centers. And with a ridership of just over 190,000 ppd, it is by far SEPTA's single busiest route, one that sees a surprising 60% more riders than the Broad Street Line. - Use longitudinal seating. This one is by far the cheapest way to increase capacity, requiring nothing more than a refurbishment of the el cars' interiors, one which (they are halfway through their design lives) they are due for soon. It's also used in several other American subways -- notably, Boston and New York. Longitudinal seating decreases seating capacity, but it makes up for it by increasing standing capacity; it's also important to notice that in the current setup, the worst crowding occurs around the doors; longitudinal seating can help alleviate that. - Convert to automatic train control (ATC). The el, like New York's 7 and L trains, is a single line with no branching. While no US transit agency has demonstrated the expertise to more than ~25 tph with human-driven subways (the MTA tried once and it failed miserably), ATC allows trains to be programmed to run at any frequency so desired. Increasing the frequency increases the runs a given trainset can make, which in turn increases overall line capacity. Indeed, when the 7's ATC installation is finished later this year, the line's peak frequency will be 28 or 29 tph -- just shy of one every other minute. - Use full vestibules. There's a lot of unused space between the el's train cars. Use of full vestibules -- essentially, an articulating chamber between the cars (much like the one on articulated buses) -- would add a lot of usable space within the boundaries of the train. 10% more, in fact. Fun fact: full vestibules are now found on metros in every single country that uses them ... except the US. The problem with this is that the current equipment is halfway through its life cycle and full vestibules would have to be a design requirement for their replacements. It would also require a rethink of el trains from a triplet of married pairs back-to-back-to-back to a single six-car unit. Indeed, thinking of trains as assemblages of cars rather than unitary bodies in their own right is often cited as the main reason why the US (whose railroad engineering expertise stalled in the 1950s) doesn't use full vestibules. One can also argue that a full-vestibuled trainset naturally locks train length in for the duration of its life cycle. But that is only an issue if we are actively pursuing infrastructure for longer trains. - Lengthen the platforms. Another way to increase the el's train capacity is, naturally, to use longer trains! But train length is currently proscribed by the length of the system's shortest platforms: therefore, it makes sense to increase platform lengths if we want to, well, platform longer trains. This is particularly problematic on the West Philadelphia elevated, whose platforms should have been extended to handle seven- or possibly eight-car trains in the recent rebuilding; the 2nd, 5th, 8th, and 11th St el stops, which can can only platform six cars and require tunneling to increase platform lengths; and the 69th St Terminal Transportation Center, where the track design of both platform approaches may well actually preclude any lengthening. Easier are the Frankford el's shorter platforms, which are now more than 20 years old and can conceivably be rebuilt to handle longer trains during a modernization program in the not-too-distant future. The downside of this is that, if you're already using full vestibules, the benefits of lengthening the platforms comes not when you've lengthened the shortest platform, but rather once you've replaced the trainsets with ones that take full advantage of the longer platforms. Of course, this can be spun: Great! Our new self-driving, longitudinal-seating full-vestibuled trains increase capacity by some 25%! Now we have some thirty-forty years to lengthen all the platforms so that we can run longer trains and further alleviate crowding now that the easy stuff's done! All that said, the fact that el crowding doesn't drop off as you head further out, but is rather end-to-end, makes it useful to look at an express track (perhaps as a couple of short segments of timed overtakes?) Such a track would offer a useful second service for passengers heading to 69th St or Frankford and thereby free up local capacity for interstitial stations. - Build an interceptor line. Not remotely incremental, this -- by far the most expensive solution of all -- builds a new line that siphons off some of the el's traffic at its source. Built as planned, a Boulevard subway would function as this: it would intercept most of the traffic on the 14 bus and near the Boulevard, as well as (assuming a convenient transfer) buses on Bustleton, Oxford, and Castor avenues, leaving primarily the 66 feeding into the el. Interceptors would also have to function as lines in their own right. This is either a feature or a bug: by intercepting most passengers taking the train to Frankford, you've opened up a lot of capacity. Capacity that can get filled up. In fact, the Media/Elwyn and Paoli/Thorndale Lines are both arguably interceptors for the el (via the 101 and 102 for the former, and the NHSL and 105 for the latter) ... and are themselves heavily used. Essentially, patronage has expanded not just to fill the core line but the lines built to alleviate capacity by intercepting it. The Boulevard subway was last projected to have the same passenger counts the el today "enjoys", a fair percentage being intercepted el passengers. But it's more than likely that that capacity would quickly get filled up, and the el run at capacity again. So it's good to think of new lines, and think of new lines not just in their own right, but how they would fit into the network; but to propose a new line solely to alleviate the capacity problems of another is not so good an idea. Induced demand is just as true for mass transit as it is for cars and bikes.